This species and the similar Vinca major are frequently grown in gardens, but V. minor is by far the commoner in "wild" situations as a naturalised alien, sometimes well away from houses but more usually close to a garden or house on a roadside bank. It is native to continental Europe. 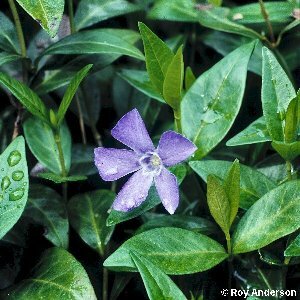 All names: Vinca minor L.